Kick off your visit on the 14th (Sun): trek along GR 34, then head outdoors with Mont Dol, and then pause for some serene contemplation at Cathedrale Saint-Samson. Get ready for a full day of sightseeing on the next day: enjoy the sea views from Phare du Cap Fréhel, then get great views at Cap d'Erquy, then take in the dramatic natural features at Pointe du Decolle, and finally stroll through Plage de l'Ecluse. To find maps, ratings, more things to do, and more tourist information, read our Saint-Malo trip planner . Lisbon, Portugal to Saint-Malo is an approximately 9-hour combination of flight and train. You can also fly; or drive. The time zone changes from Western European Time to Central European Time, which is usually a 1 hour difference. Plan for slightly colder temperatures traveling from Lisbon in July, with highs in Saint-Malo at 26°C and lows at 15°C. 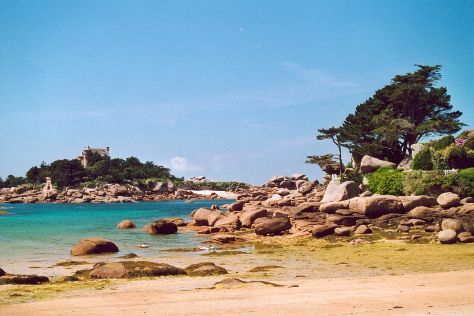 Wrap up your sightseeing on the 15th (Mon) early enough to drive to Perros-Guirec. On the 16th (Tue), identify plant and animal life at Sentier de L'ile Renote, make a trip to 'Eglise de Saint Jacques, enjoy the sea views from Ploumanac'h LIghthouse, then take in the dramatic natural features at Cote de Granit Rose, and finally see the interesting displays at Cite des Telecoms. Here are some ideas for day two: kick back and relax at Plage de Trestraou, then take in the architecture and atmosphere at La Cathedrale Saint-Tugdual, and then head outdoors with Sillon de Talbert. To find photos, ratings, reviews, and other tourist information, you can read our Perros-Guirec travel planning app . Traveling by car from Saint-Malo to Perros-Guirec takes 2 hours. Alternatively, you can take a train; or take a bus. While traveling from Saint-Malo, expect a bit cooler days and about the same nights in Perros-Guirec, ranging from highs of 22°C to lows of 15°C. Finish your sightseeing early on the 17th (Wed) to allow enough time to drive to Concarneau. Concarneau is a commune in the Finistère department of Brittany in north-western France. Kick off your visit on the 18th (Thu): examine the collection at Haliotika - La Cite de la Peche, enjoy the sea views from Phare d'Eckmuhl, then make a trip to Pointe de la Torche, then explore the world behind art at Musee de la Faience de Quimper, and finally explore the historical opulence of Chateau de Keriolet. Keep things going the next day: admire the masterpieces at Musee des Beaux Arts, take in the spiritual surroundings of Eglise de Saint Ronan, examine the collection at Musee Departemental Breton, then contemplate the long history of Musée de Pont-Aven, and finally see the interesting displays at Musee de la Peche. To see where to stay, traveler tips, reviews, and other tourist information, read Concarneau route maker tool . Getting from Perros-Guirec to Concarneau by car takes about 2.5 hours. Other options: take a bus; or take a train. In July in Concarneau, expect temperatures between 24°C during the day and 15°C at night. Cap off your sightseeing on the 19th (Fri) early enough to go by car to Brest. Brest is a city in the Finistère département in Brittany. Kick off your visit on the 20th (Sat): shop like a local with Le Fonds Helene et Edouard Leclerc pour la Culture, contemplate in the serene atmosphere at Enclos Paroissial de Guimiliau, then take in the architecture and atmosphere at Cathedrale Saint-Paul-Aurelien, and finally appreciate the extensive heritage of Site of Meneham. Keep things going the next day: admire the verdant scenery at Vallon du stang Alar, then visit a coastal fixture at Le Phare du Petit Minou, then brush up on your military savvy at Musee Memoires 39-45, and finally enjoy the sea views from Phare de Saint Mathieu. To find reviews, photos, and more tourist information, read our Brest trip itinerary planner. You can drive from Concarneau to Brest in 1.5 hours. Another option is to take a bus. In July, daytime highs in Brest are 23°C, while nighttime lows are 15°C. Wrap up your sightseeing on the 21st (Sun) to allow time to travel back home.